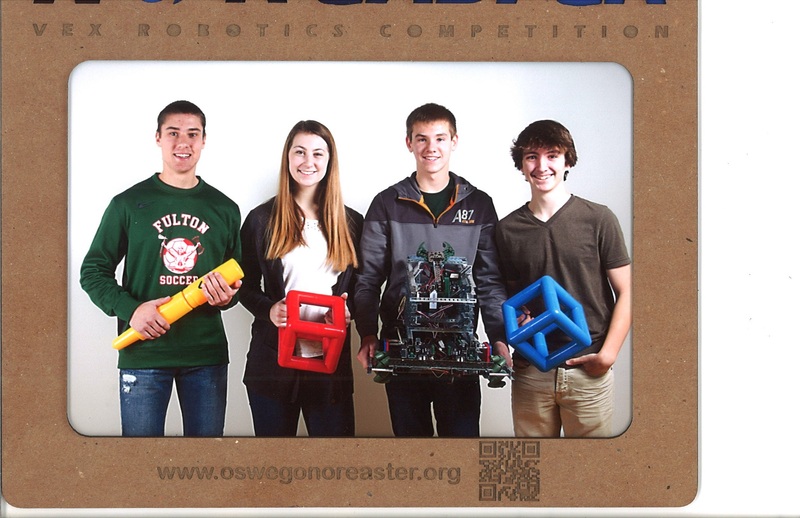 On November 22, eight students and their adviser, Mr. Thurlow, from G. Ray Bodley High School competed at SUNY Oswego in the Oswego Nor’easter VEX competition. Students from left: Caitlyn McAfee, Nate Summerville, Jeremy Sampson, Nathan Smith. VEX is a robotics company that has built a program to challenge high school students to engineer robots to compete against each other. During competitions students get a chance to earn a place at the state championship where the winning team can move onto the world competition competing for scholarships. Students learn valuable skills during preparation for and during the competitions. Team work is a must; each student brings their own unique skills during building and competitions. During actual competitions they build alliances with other teams in order to progress further in competitions. 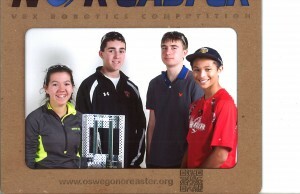 Students from left: Garet Roik, Amanda Blake, Jake Cuyler, Tim McAfee. All the students work on building and programming the robots during their free periods and after school. The students need to be able to answer questions regarding why and how they decided to design their robots and how that helps them control the functions that the robot needs to be able to accomplish. 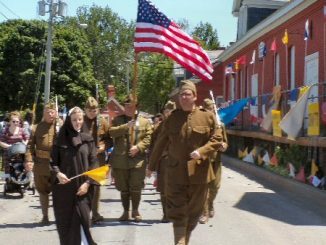 So far during the 2014-2015 school year, students have represented G. Ray Bodley high school at competitions, on News Channel 9’s Bridge Street and by working with the Oswego County Literacy Program. 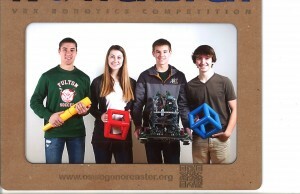 They also have one robot that has earned its chance to compete at the state level.